From 1984 until 1992, Dr Anatoliy Grytsenko worked as an Instructor at the Automatic Control and Navigation Systems Department of the Air Force Institute in Kyiv. After joining the Ministry of Defence (MoD) in 1992, he held the post of Senior Officer with the Analytical Office at the MoD Main Education Directorate. Two years later he was appointed the Deputy Director of the Office. After this he was promoted to Director of the Concepts and Analysis Division at the General Staff Research Centre. From 1996 until 1997, he directed the Military Security and Defence Studies Division of the National Research Centre for Defence Technologies and Military Security. Following his appointment as the Head of Analytical Service at the National Security and Defence Council Staff in 1997 he became the President of the Ukrainian Centre for Economic and Political Studies. 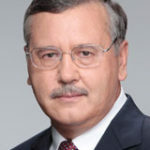 From 2005 until 2007, Dr Grytsenko served as Defence Minister of Ukraine in the governments of Yulia Tymoshenko, Yuriy Yekhanurov and Victor Yanukovich. Grytsenko went on to serve as the Chairman of the National Security and Defence Committee at the Parliament of Ukraine (2007-2012), and as the Chairman of the subcommittee on fighting money laundering (2012-2014). Anatoliy Grytsenko argues that the ‘Minsk format’ negotiations are moribund, and instead calls for an expanded ‘Normandy format’ inclusive of the USA and UK.